Get the grill ready. The Cooking Channel has announced Man Fire Food will return for a fifth season in July. The docu-series follows Chef Roger Mooking as he travels the country exploring innovative methods and techniques to cook with fire. Season five will see Mooking head to Miami for roasted pork, to Nashville for some old-fashioned BBQ, and to Georgia for some rabbits cooked rotisserie style. Season five of Man Fire Food premieres on July 5th at 9 p.m. ET and 6 p.m. PT. NEW YORK – June 9, 2016 – Whether it is cooking over an open fire, grilling over charcoal, barbecuing low and slow, or smoking in the pit, Chef Roger Mooking is sharing more of his fascination with flames on the new season of Man Fire Food, premiering Tuesday, July 5th at 9:00pm ET/6:00pm PT on Cooking Channel. On the 13 half-hour long new episodes, Roger follows the smoke signals across the country learning how pitmasters and local chefs use inventive methods and techniques to create sizzling hot, flavorful dishes. Trinidadian-born Roger Mooking is no stranger to combining various influences to new and exciting culinary adventures. He is the host and co-creator of his internationally broadcast television series Everyday Exotic. His award-winning cookbook, based on the show, explores pairing ingredients from all corners of the globe with everyday meals. Mooking co-hosted Heat Seekers on Food Network, and is a recurring judge on Chopped Canada. He recently opened Twist By Roger Mooking, a restaurant that incorporates global flavors into locally sourced, North American comfort food, making him a third generation restaurateur. Taking his talents outside of the kitchen, Roger released his most recent album, “Feedback Acoustic”. For this Juno award-winning recording artist, the music and epicurean world are seamless. One feeds the body, the other the soul; it is all food in all its various forms. Premiering Tuesday, July 5th at 9pm ET/6pm PT -“Too Hot To Handle”- SEASON PREMIERE! In Miami, Roger Mooking meets a chef who celebrates Latin Flavors with a unique coal-fueled contraption called the Cross Table used to roast butterflied pork marinated in bold achiote paste, and simmer a bountiful seafood paella in an unbelievably massive pan. Roger then makes his way to Birmingham, Alabama to visit OvenBird, known for its wood-fired kitchen. The chef there has created a one-of-a-kind portable oven that delivers a double dose of heat used to cook up a meat lover’s feast of lamb, rabbit and beef along with the season’s best vegetables. 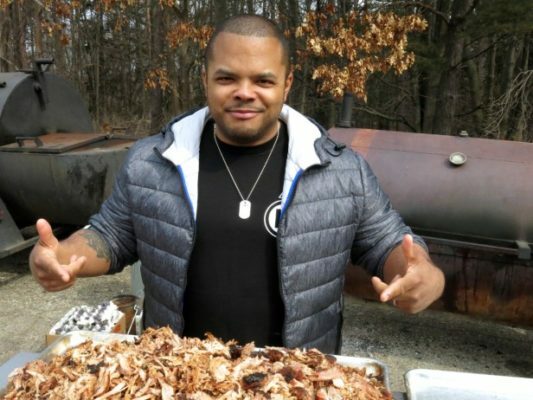 Roger Mooking heads to Hamaknockers Bar-B-Que in Crawfordville, Florida, where a young pitmaster pulls pork like no other – with a power tool! Roger comes face-to-face with their signature sandwich, The Hamaburger, a juicy patty piled high with mouthwatering pulled pork, bookended by two hearty slices of buttery Texas Toast. In Dade City, Roger meets a farmer preserving the old Florida tradition of making cane syrup in a gigantic 100 year-old kettle over an open fire. Roger helps to harvest and juice the sugar cane, and patiently waits as the juice simmers down to a gooey syrup that they drizzle over warm homemade biscuits. Roger Mooking meets with two Southern ladies famous in the barbecue world. In Nashville, Roger has eyes only for the smoked ribs at Mary’s Old Fashioned Pit Bar-B-Que. At Helen’s Bar-B-Q in Brownsville, Tennessee, Roger meets a legendary pitmaster and helps cook pork shoulders, pork ribs and a whole stick of bologna. In Georgia, Roger meets a chef that loves to break out of his butcher shop to cook outdoors, and he is pulling something out of his hat: over a dozen rabbits cooked rotisserie-style with bamboo poles. In Plano, Texas, Roger visits Smoke to take a stab at cooking flank steak and chicken on swords. Plus much more this season on Man Fire Food. What do you think? Have you seen Man Fire Food? Will you watch the new season? More about: Cooking Channel TV shows: canceled or renewed, Man Fire Food, Man Fire Food: canceled or renewed?